Today was my last day in Hanoi. That meant running a few more errands and cramming in a few things I hadn’t fit in before. On the errands front, let me just say that it’s damn near impossible to find a place that sells contact solution. I’ve spent the last few days popping in and out of pharmacies, grocery stores, convenience stores, cosmetic shops, and anywhere else where I might find eye care products. Sometimes they have eye drops, but they’ve never had cleaning solution. The only reason I found some is because I stumbled on a prescription eyeglasses store and popped my head in to ask if they knew where I could buy lens solution. The lady happened to have two bottles in stock and happily sold me one. So kids, next time you’re in Vietnam and run across a bottle of solution, just buy it. Who knows when you’ll see the next one. 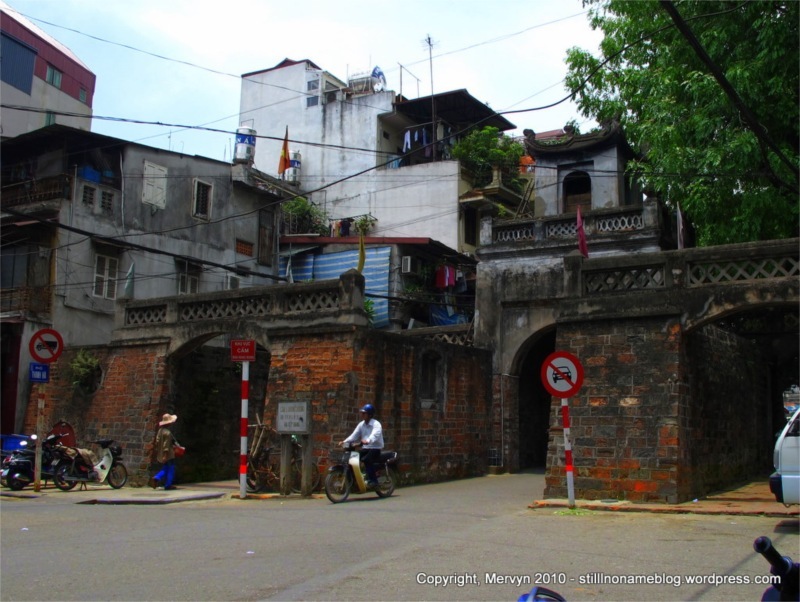 In other news, I did a more deliberate exploration of Hanoi’s Old Quarter. I’ve been staying here for a few days and have wandered, but I haven’t really done a self-guided tour. The area is known for having specific streets that sell specific items. 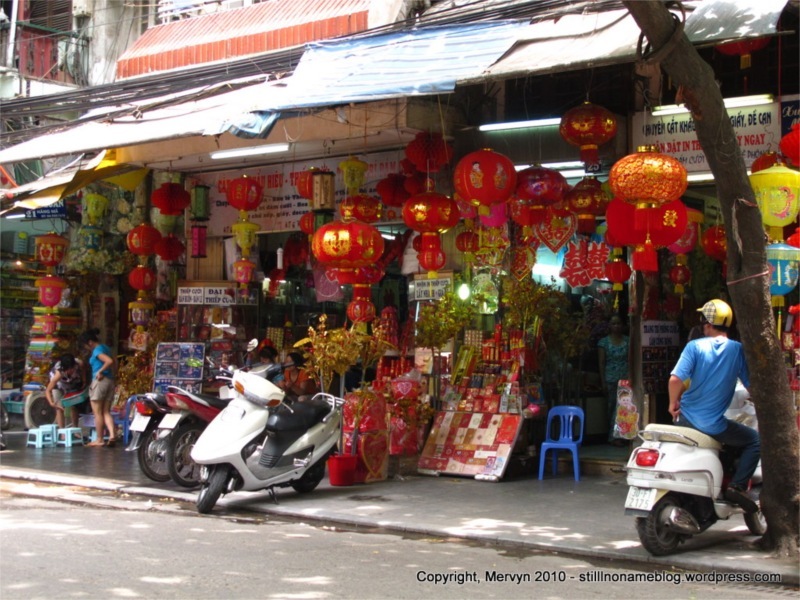 For example, one street I came across sold paper lanterns and other red and gold regalia. Another sold gravestones. One near my hotel sells kids’ toys and another sells slippers and sandals. We’re talking random stuff here. The beauty of these streets is that there’s always something interesting to see. 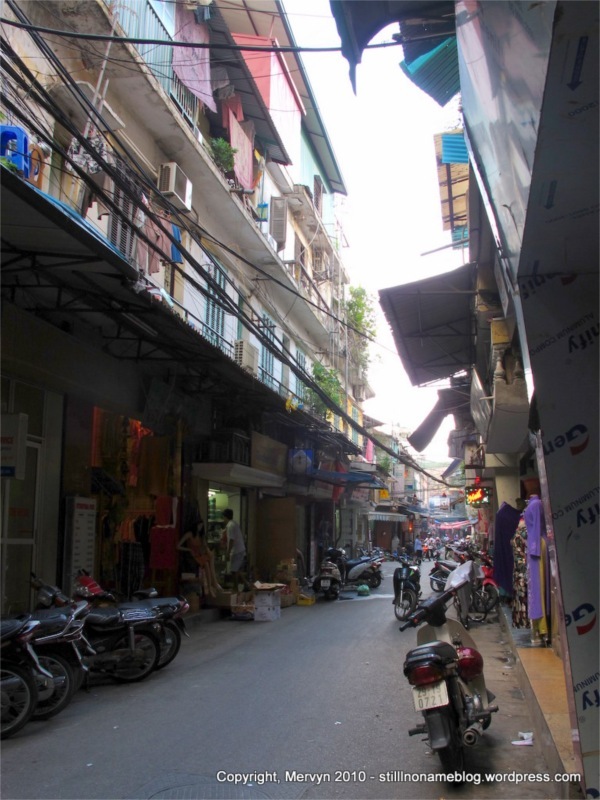 You’ll be walking along and the street will collapse into a little alley then broaden out into a larger avenue, almost without rhyme or reason. At one point, I came across an old gate that had been part of the old city. It was just sitting there, like it was normal to have a parapet next to a few shops. As you move through the streets, you’re reminded that this isn’t just a tourist attraction. People actually live and work here. The number of travel agencies and English-named restaurants thins and you’re suddenly in little warren streets that are clearly neighborhoods. It’s a nice change of pace. I ended up eating lunch at Cha Ca Thang Long, a restaurant famous for its cha ca, which is filleted fish, grilled at your table, mixed with a mess of herbs and peanuts. This restaurant is the more casual sister to Cha Ca La Vong, which I’ve heard tends to draw bigger crowds. A friend pointed out that this made someone’s “1001 Things You Must Do Before You Die” list. That may be high praise, depending on whether you think 1001 things is a lot or not. I barged into the air conditioned restaurant after a 1 hour walking tour of the Old Quarter. I must have looked like death sweated over. I asked for a table for one and immediately became a curiosity. Everyone was there in groups besides me. Not the first time. Of course they thought I spoke Vietnamese, but when it became clear that I was a foreigner, they decided to give me some help. Cha ca is a self-assembled dish, so a young guy with an affect flatter than a two-day-old glass of Sprite wordlessly put together my first bowl. The drill: some rice noodles as a base, a heaping amount of raw herbs, the fish and the herbs from the grill, some peanuts, then a drizzle of sauce (with peppers, if you prefer). I’d read a couple of reviews online and they ran the gamut of “overpriced, horrible” to “awesome, great value.” First off, I don’t think it’s overpriced. You’re paying less than $5 (80,000 dong) for a specialty. Cha ca is the only dish on the menu. I’m sure you can get it cheaper, but you’ll have to hunt it down. Second, the food is good, so long as you like herbs and fish. I have a soft spot for fresh vegetables and herbs and meat, dating back to the first time I ever ate Vietnamese at a classmate’s house in high school. The crunch of raw veggies and the soft saltiness of the meat is one of life’s perfect combinations. Cha ca has the added benefit of being a bit lighter because of the fish. The peanuts are key to the dish, because they add an extra crunch and a bit of nutty flavor (surprise!). The fish is cooked in oil, which I think is a bit spicy, so there’s some bite. The rice noodles add a softness to it and provide a silkier texture than plain steamed rice. I liked it. I’d definitely eat there again. It’s definitely a group eating place, though. Like Korean barbecue or hot pot, it’s probably much better with a bunch of people grabbing and assembling their food while chatting and throwing back a few. Not sure it would make my “1001” list, but it definitely would make my “Fun Things to Eat with Friends” list. If you’re in Hanoi, I say give it a shot. Just know what you’re getting yourself into. I spent the rest of the day wandering the Old Quarter streets, trying to kill time before my 9:40 p.m. train. I’d checked out of my hotel before noon, so I had no place to go to just sit and relax without paying. I ended up going to a local burger joint and hanging out over dinner until the power went out on the block and the café turned into a dark hotbox. Quick shower at the hotel, courtesy of the kind owner of Thuy Nga, a change of clothes, and that finished off my time in Hanoi. 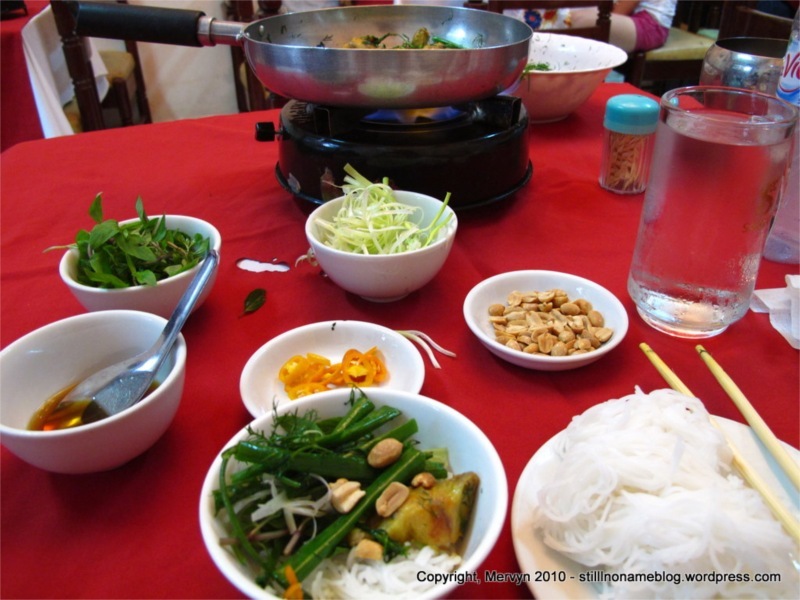 As I sat in the hotel lobby, I realized that one thing I’d miss about Vietnam was the food culture. Every street, almost no matter where you go, there are people grilling meat, selling halo-halo like drinks, dishing out bowls of pho, or chopping up dried squid. Locals will just plop down on little six-inch plastic stools, sometimes spilling onto the street so they can hang out and eat. It’s fantastic. As I was thinking this, two girls sat down and ordered food at the street-side food shop, sat down on the side of the road at a table, and had a meal. I have a feeling I won’t see much of this in China. I get the feeling the six-inch stool is uniquely Vietnamese. It’s too bad, too. They’re more comfortable than you think. And they make you feel like a towering giant which, for a guy who didn’t break five feet until his sophomore year in high school, is just awesome. Time ran out on Vietnam. I grabbed a motorcycle taxi and soon was on the train and off to China. Good times. I can only hope China’s half as good. GALLERY: Click through to today’s gallery to see more pictures of the Old Quarter, cyclo taxi drivers waiting to snag tourists, and an extra pic of people eating food at kindergarten stools.